Everyone who buys a new computer monitor needs to decide on the best display technology for their uses. This doesn’t just mean the size or resolution of the screen – you also need to decide on the panel type you want to get. That’s especially true for photographers, graphic designers, and anyone who works with color; the wrong decision could mess up the colors you see. This article explains IPS monitors and why you might need one for your work. Although the end of this article has a more technical explanation of IPS monitors, the definition above is the most important thing to know. 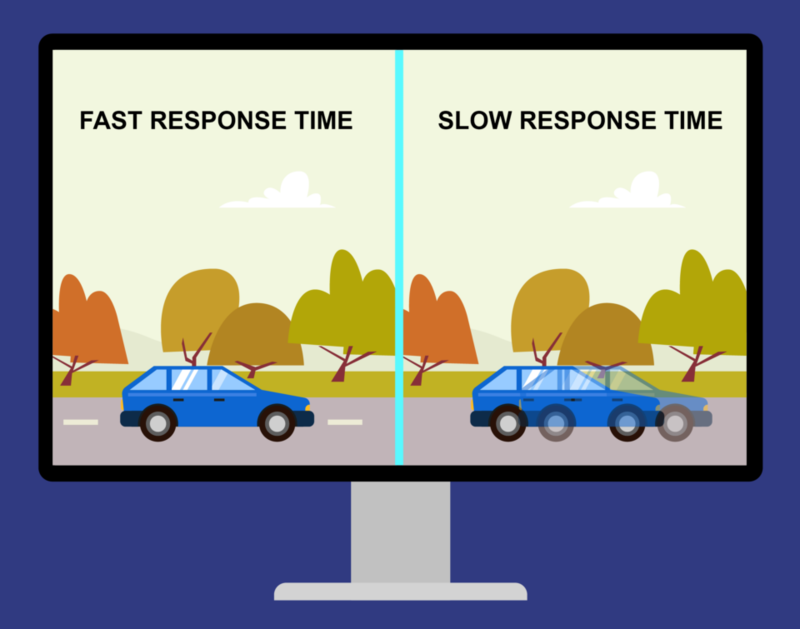 Once you understand it, read on to figure out if you need an IPS display for yourself. Which Devices Have IPS Panels? Right now, many products on the market have IPS panels, and the number is only growing. For example, most Apple products today include them, from phones to iPads to laptops. Although there are many reasons why companies want to produce IPS displays, the most important is simply screen quality. However, this doesn’t mean that all screens, or even a majority today, are IPS. Standard desktop computer monitors tend to have less expensive TN panels instead (“twisted nematic”). And televisions often have VA monitors (“vertical alignment”) which can display dark tones with more detail. In short, although many displays on the market are IPS, it is not the only technology available. Are IPS Monitors Too Expensive? IPS monitors often cost more than other panel technologies. This is especially true compared to TN monitors. If you want a desktop IPS monitor, the typical price range for a lower-end option is around $300 new, sometimes lower or higher depending upon size. Truly high-end IPS displays can cost thousands of dollars. These products tend to have greater resolution and a larger color gamut (capable of displaying a wider range of colors), among other improvements in image quality or features. This includes things like better uniformity, backlighting technology, built-in calibration tools, a larger screen size, and so on. So, should you get an IPS monitor? It depends upon the work you’re doing. For anyone in the field of visual art, it is all but essential. Personally, as a photographer, IPS is the only panel technology I would use right now (or a variant – there are many, all of which generally go by the moniker “IPS”). It simply is the best way to get accurate color that show, as much as possible, how your image really looks. And if your budget is limited, you don’t need to get one of the most expensive IPS panels, either. Even the lower-end options can be quite good, certainly with better colors than similarly priced TN displays. However, if maximum color accuracy isn’t really important to your work, an IPS monitor may be overkill. And, for some applications, you may even prefer a TN monitor instead, since it has its own set of advantages. We’ll cover those below. Their fundamental design is quite similar, as we will cover later, but the differences are enough to put these two types of monitors into very different segments of the market. Although photographers and graphic designers generally prefer IPS monitors, general users and gamers often prefer TN panels instead. Which one is better for you? Here are some of the main advantages of each. Arguably the biggest advantage of IPS monitors is that they look consistent at a much wider range of viewing angles. TN panels are pretty bad in this respect. If you look at the monitor from the top, bottom, or sides, the colors will start to change, and may even invert completely! The screen also changes in brightness as you move, sometimes even small movements. This can make it tricky to know when you’re actually looking at the image how it is meant to be seen, leading to inconsistencies if you’re working with photos or other digital art. IPS monitors aren’t perfect in this respect – they also can change when viewed from the sides – but they’re much better. It takes far more extreme angles for IPS panels to shift colors dramatically; typical IPS monitors claim about 178 degrees of viewing freedom in all directions (though you’ll still want to be centered to minimize whatever shifts there may be). IPS monitors have another major benefit over other options on the market: They can reproduce 8-bit color (256 shades of each primary color) naturally, without blending 6-bit colors (64 shades per primary color) for the same effect, as TN monitors generally do. To define it precisely, they can achieve 8-bit color, or sometimes more, without dithering. Dithering means that your display places two “almost correct” pixels adjacent to one another to give the illusion of correct color. The real question, though, is whether we’re capable of seeing the differences. Although that depends upon the particular monitors in question, it certainly can be visible in some cases, particularly in gradients of color. 8-bit monitors simply tend to look smoother. But keep in mind that this varies on a screen-by-screen basis, and you may find some 8-bit IPS monitors that also have bad color gradients. If you want to display a larger subset of colors (gamut), IPS is the way to go. Although there are no monitors on the market capable of displaying the entire gamut of colors humans can see, good IPS panels get you closer than TN. This is the information you’ve probably heard if you see a monitor advertising “100% of sRGB color space” or “98% of AdobeRGB colors space” – they’re referring to the subset of colors which they can display. A larger gamut is preferable, since it increases the range of colors it can display accurately from your photos (yes, most monitors can’t display all the colors in your photos). You won’t find monitors that can display every color we see, but a high-end IPS display is better than a TN display. Different screen manufacturers advertise their “contrast ratio” for a particular display – something like 1:1000. Those numbers aren’t comparable across brands, and they don’t really matter when you’re buying a monitor. However, that doesn’t mean the concept of contrast ratio is useless. Monitors with better contrast ratios let you discern more details in the dark region of the display, with more tonality in the shadows. This is a big deal for photography and graphic design, where you may be dealing with subtle differences in dark regions of the image. IPS monitors almost always have better contrast ratios than comparable TN panels, even though newer TN panels are catching up. And the third type of display, VA monitors, often have the best contrast ratios of all (again, why they’re so common for televisions) – but they aren’t generally as good for color accuracy, so photographers tend to stick with IPS instead. Because TN panels are less expensive than IPS monitors, it’s no surprise that they are more common. If you bought a desktop computer that shipped with a free monitor, it’s almost certainly TN. The same is true if you bought most laptops, aside from the higher-end options. Although you may be tempted to get an IPS monitor if your budget allows, keep in mind that the lower price of TN panels means you can get bigger, higher-resolution monitors without spending a fortune. If it’s a choice between a large 4K TN panel or a smaller 1080p IPS panel, which would you choose? Personally, for photography, I would prefer a smaller IPS panel in this scenario – but if you don’t use your computer for color-sensitive applications, TN panels tend to offer a much better value. Historically, one of the advantages of TN panels over IPS panels has been their refresh rates – the number of times per second which the display refreshes its image. They also tend to have faster response times, the time it takes for a given pixel to change shade as quickly as possible (usually measured from gray-white-gray or black-white-black). These benefits don’t really matter for photography and graphic design work, since you generally aren’t dealing with fast-moving objects on screen, and it’s not a big deal if you have a slight amount of ghosting. But it can be important to other applications, especially fast-paced gaming, where a long response time or refresh rate can be annoying. Then again, the advantage here is not as much today as it was in the past. IPS monitors are catching up to TN in terms of refresh rate. Plus, given the color reproduction and viewing angle benefits of IPS monitors, many people are starting to prefer them for gaming applications anyway. The better option overall depends upon your personal priorities. Of course, price comes into play here again. IPS monitors can add a significant cost to your overall setup if you have multi-monitor system, especially if you buy higher-end options with fast refresh rate. With lower-end IPS monitors, it is very common to see something known as “IPS glow.” This is when the backlight behind the IPS panel is brighter in some areas than others, generally along the edges of the screen. Just like with refresh rates, this is something that IPS monitor manufacturers are constantly improving. However, I can say from personal experience that the two low-end IPS monitors I’ve owned (both in the sub-$300 range) did exhibit some areas of glow, and it seemed to get worse over time. This round goes to TN panels, which don’t experience the issue to nearly the same degree. Screen glow poses a bigger problem to fields like photography and design, but the problem isn’t so large that it should sway those users away from IPS panel. Instead, if it fits your budget, just get a higher-quality IPS display – one with minimal potential for glow. TN panels also have more minor benefits over IPS panels, which may matter for your particular use. On one hand, they tend to have lower power consumption, making them useful for laptops. They also tend to be brighter at their maximum, which you may prefer if you work in an area with lots of light. You might also find other benefits on a monitor-by-monitor basis. We have already written an article on monitors we recommend for photography, all of which have IPS panels. In short, for high-end applications, two of the best brands are NEC and EIZO, particularly when it comes to uniformity. But you can also find good monitors from Dell and other companies if price is a priority. Because IPS monitors range in price from a couple hundred dollars to several thousand, there are options available regardless of your budget. If you’re familiar with polarizing filters in photography, you may have a good idea of where this is going. Quite simply, when you put two polarizers on top of one another (the second one flipped) and rotated perpendicular, little to no light passes through. If the same two polarizers are rotated to be parallel, light passes through just fine. This, in fact, is how vari-neutral density filters work (see our filter article). LCDs don’t actually rotate the two polarizers. That would not be possible, since both are large sheets the size of your monitor – and they would need to be rotated on a pixel-by-pixel basis for any image to appear. Instead, they do something clever: They have a very thin layer of liquid with crystals between the two polarizers, and a voltage applied to the crystals can change their orientation. By default, the crystals in this layer are oriented in a particular way that either rotates light from the first polarizer or doesn’t (it depends upon the monitor technology). Here’s the key: When voltage is applied to the crystals, they change their orientation to rotate light in the opposite of their resting state. This is where light and dark pixels come from. A single backlight shines through the whole panel, and your computer applies a voltage to individual parts of the monitor. This changes the orientation of crystals suspended in liquid. Lastly, depending upon the monitor technology you’re using, this change in orientation leads the light to rotate and pass through the second polarizer unimpeded – or to be blocked by the second polarizer instead. 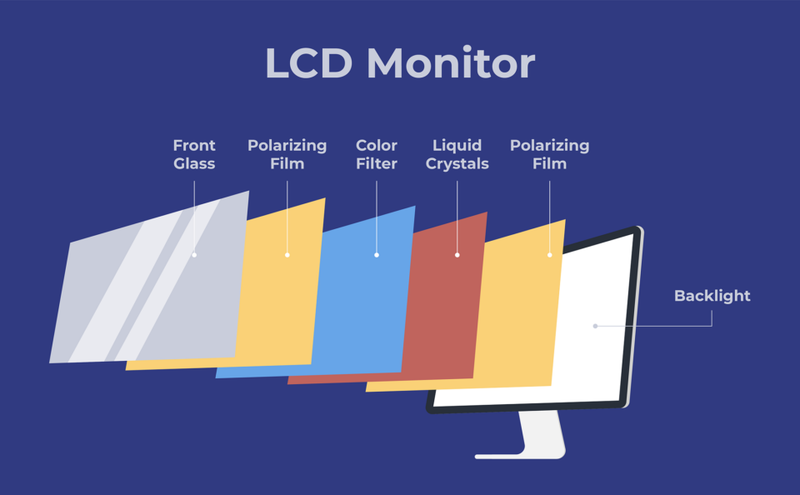 By putting color filters over each pixel (red, green, or blue – RGB) and making the pixels small enough, the monitor can then give the appearance of full color by varying the voltages applied to each part of the LCD. TN: The two polarizers are aligned perpendicular to one another. By default, in their resting state, the liquid crystals in the LCD are helix shaped, essentially “twisting” the polarized light from the first polarizer 90 degrees so that it goes through to the second unimpeded. By applying an increasing voltage, the molecules in the liquid crystal rearrange orthogonal (perpendicular) to the two polarizers, like hairs standing up on your arm. As a result, the polarized light that passes does not get twisted 90 degrees, leading the second polarizer to block it. IPS: IPS monitors are similar in many ways, although the liquid crystal molecules don’t have a helix structure. Instead, the crystals are aligned with the plane of your display at all times, and applying a voltage spins them 90 degrees horizontally. This is why they’re called in-plane switching. Another difference is that the second polarizer blocks light when IPS monitors are in their resting state, rather than letting it through. So, applying the voltage turns the molecules in order to allow increasing levels of polarized light to be twisted correctly to pass through the second polarizer. Given that we have only talked about IPS monitors so far within the context of LCD screens, some people may wonder if IPS technology is also possible with LED (light-emitting diode) displays. After all, LED monitors are becoming more and more popular these days, both for phones and desktop monitors. However, although this is a natural question to ask, it requires more specificity in order to answer. What do you mean by LED? Are you referring to any screens that are advertised as LED, or specifically to the “true” LED displays – frequently called AMOLED/OLED displays – where each pixel itself is an LED, that are much rarer and found on fewer products today? It’s important to make this distinction. Often, you’ll see regular computer monitors that have LED backlights rather than traditional CCFL backlights (cold cathode fluorescent lights). Although these still tend to be higher-end monitors, they’re not fundamentally different from what we’ve talked about so far. It should be no surprise that you can have an IPS panel even when your monitor backlight is LED. But there are other displays on the market which are “true” LEDs, meaning that each individual pixel is a separate LED. These are a completely different technology that doesn’t have a liquid-crystal component at all. They are often advertised as AMOLED or OLED, and they’re much less common on the market. However, some Samsung Galaxy phones have an AMOLED display, and the upcoming iPhones are rumored to have them as well. As the technology becomes less expensive to produce, we may see it become more common in computer monitors, too. As you probably gathered, you cannot have an IPS panel when your display doesn’t even have liquid crystals, so no, there are no IPS AMOLED/OLED displays. Hopefully, this article gave you a good understand of IPS monitors and whether or not you need one for your own work. 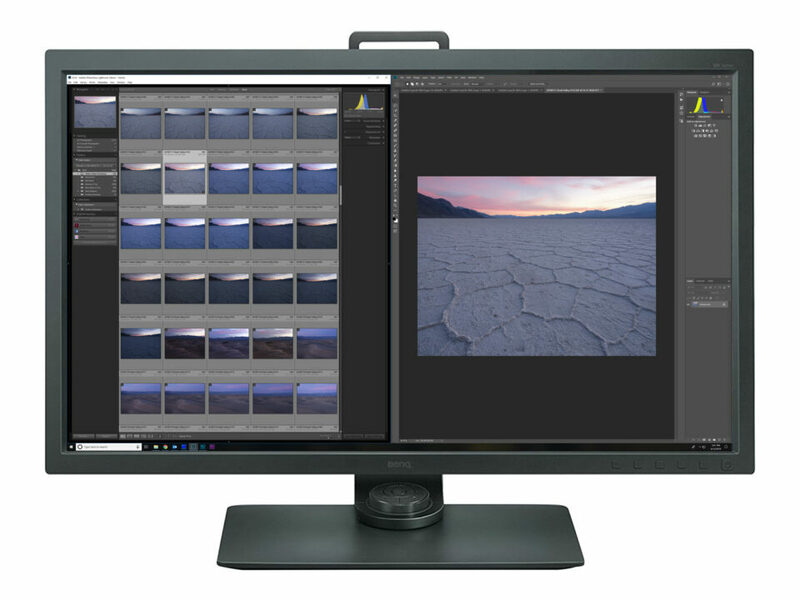 The simple takeaway is that photographers, designers, and other users who value maximum color accuracy will want an IPS monitor. If color accuracy isn’t as important to you, and you want a less expensive monitor (or one with higher specs for a given price), TN is the better option. I’ve a LG 22″ Full HD IPS LED TV which can be used as a computer monitor. Is it suitable for editing photos ? Suitable, perhaps. It would be better than a non-IPS monitor of a comparable price. However, it is about the least expensive IPS display you’ll find, and it is meant to be a TV. I’ve never used one, but those two factors lead me to believe that it will not be an ideal display if you want a large color gamut, color uniformity, no light leaks, good contrast, and so on. And you’ll certainly want to calibrate it, as I suspect the defaults will not be very accurate. Great article Spencer, thank you. I bought an ASUS IPS sRGB Monitor last fall and I am very happy with the performance. 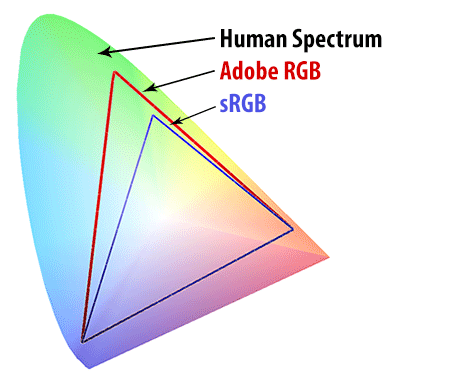 One aspect of your review that might benefit from a little more explanation is the color gamut selection and the difference between Adobe RGB and sRGB given the price difference between the two. In researching the two options for colour reproduction the difference appeared to me to come down to one overriding factor, calibration. If you want the larger colour gamut using Adobe RGB be prepared for yearly calibration whereas sRGB comes factory set and in theory will not need re-calibration. The ASUS can be manually calibrated if required, I am not sure if other manufacturers provide this option. For me I was willing to sacrifice a larger colour gamut so I would not need to re-calibrate yearly, others with more technical prowess might not find this an issue. Thank you, Michael, and glad to hear that you like your monitor! Calibration is important regardless of the gamut of your display. It’s always best practice to re-calibrate yearly because any monitor can fade over time, not just Adobe RGB. Thanks for catching that, just a typo. IPS is absolutely ideal if you need color accuracy. Well thank you, Martin – I do always appreciate when readers like you find errors or typos that can be fixed! It helps make Photography Life as good as it can be.